This ivory wedding dress dress in matt satin looks as if it is a separate bodice and skirt, but is actually one piece. 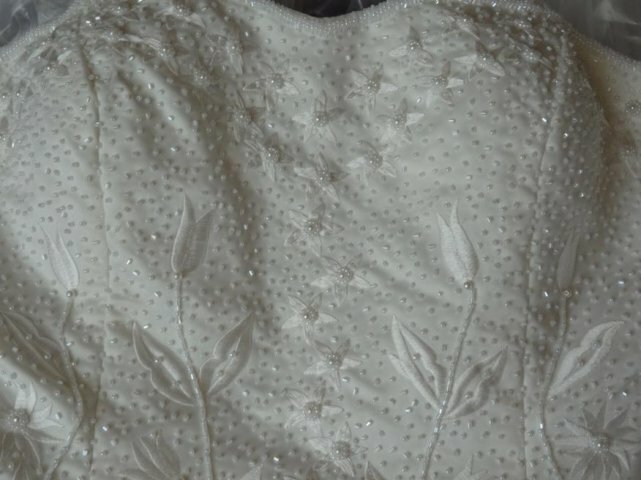 The bodice is strapless and is adorned with hundreds of little crystal blocks and pearls. THe decoration is across the whole bodice, back and front, and fastens with a concealed zip, Straps can be added. The skirt is a very small A line shape with a puddle train.